GENERON‘s years of project management and engineering services experience, combined with our years of development and research allows us to treat a wider range of chemicals and offer an option for recovery other than combustion for tank and truck loading facilities. GENERON, along with our wholly owned ACFM group, has significant experience in hydrocarbon recovery systems. More than 100 large units have been installed in petrochemical applications to recover butane, pentane, hexane and other hydrocarbons. Hundreds more units have been installed for gasoline vapor recovery at truck loading and retail gasoline stations. The VRU is designed specifically to offer a more feasible way to treat vapors that are not compatible with a carbon based system. The separation efficiency is custom designed for each application. A better alternative for plants that handle petro-chemicals & chemicals. Compatible with a wider range of hydrocarbons & various crudes. Compact design; a smaller footprint compared to the equal sized carbon system. 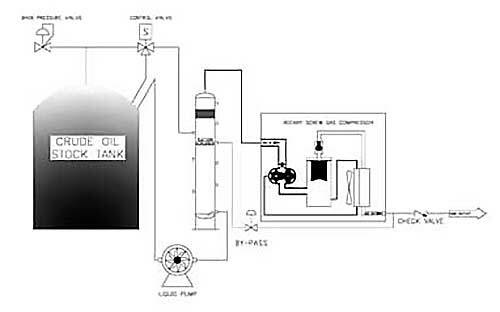 Steady state process for constant flow design applications. Fewer moving parts & control requirements compared to other technologies. Inlet compressor eliminates process pressure drop issues; inherently safe design. For more information on GENERON® Gas Separation and Conditioning, please contact us at +1.713.937.5200 or using our online form.